I know it's not officially spring and I also realize that in other parts of the country it's cold, rainy and/or snowing, but spring has officially sprung in my book. First of all it's hot here. Second, the flowers are in bloom. Last of all, the days feel very long now that daylight savings has taken effect. Is it just me, or am I the only one who loathes daylight savings? I know I can't be the only one because whenever daylight savings kicks in, my husband repeatedly utters that it's an obsolete practice from the bygone agrarian culture in which we used to live and that it hasn't been relevant for a century due to gas and electric lighting. I personally couldn't agree more. I was just getting used to the time change that happened last fall and now I have to change again? No thanks! Plus, it's now dark out again when I leave for work and that's just depressing. The only positive is that it's fully light out when I get home which makes for better blog photos. If that's the only silver lining here then I will take what I can get. 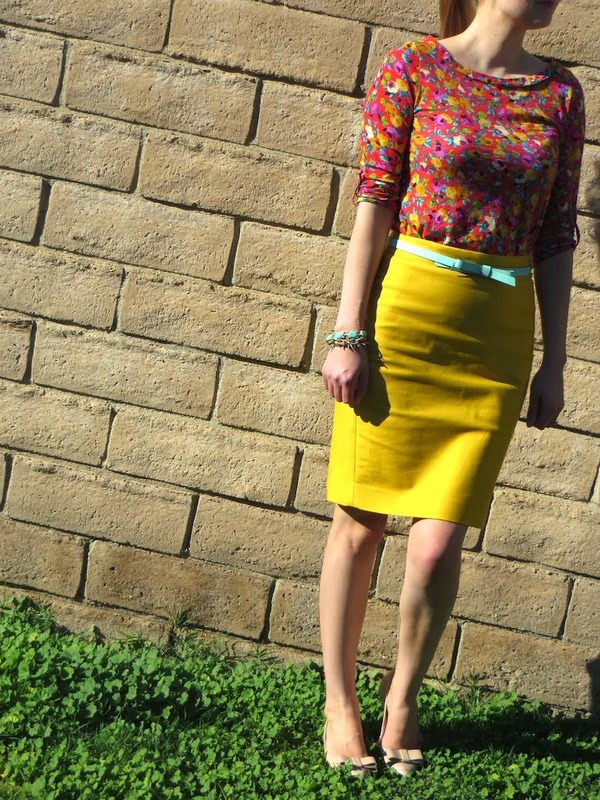 Today my ensemble is totally spring inspired with bright colors and blooming flowers. I feel that I can fully embrace these types of colors and patterns now that spring has sprung, at least where I am. I seriously want this entire outfit. It's pretty mild here too so I got to venture ankle length pants today for work - hurrah! I will try to send some warmer weather your way! I am not entirely sure I am ready for the really hot weather just yet! super cute and beautiful bright colours - perfect for spring! Thanks phiphi! It's been fun to get out all of the bright colors in my wardrobe for spring.